Why have I never made Shepherd's Pie before? I wonder because I made it for dinner on Friday--a cold, rainy Spring evening--and now I want to eat it every day. 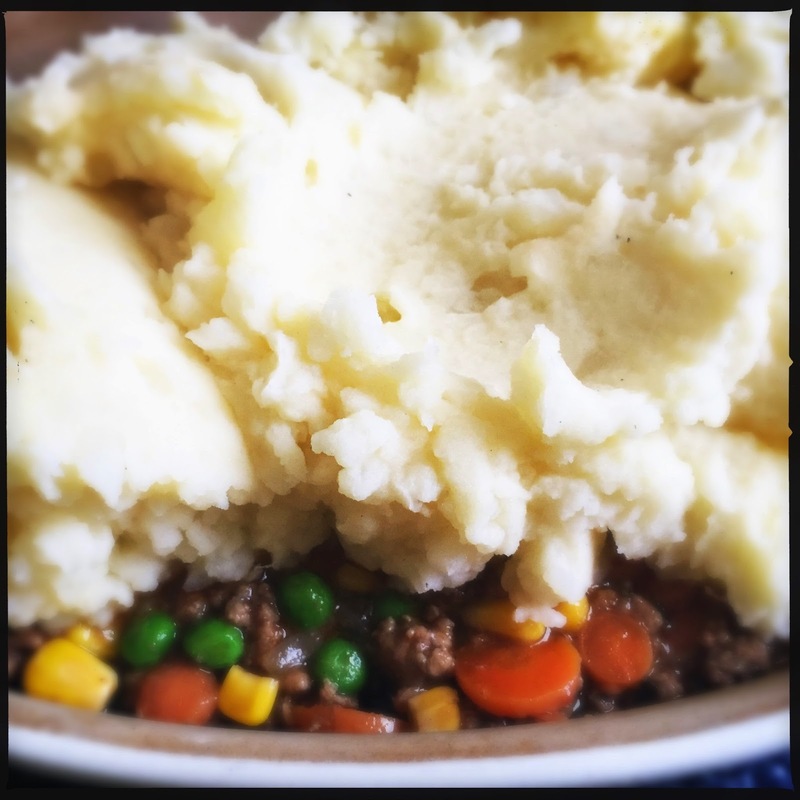 According to Cook's Info, "Shepherd's Pie probably originated in Scotland and in the north of England. Originally, it was made from chunks of meat, probably leftover from a roast. [...] The dish as we know it, though, couldn't have originated before potatoes became generally accepted in the UK, which wasn't until the end of the 1700s. Before that, the dish--or a very similar one--was made in Scotland but topped with a pastry crust instead of mashed potato. The name [Shepherd's Pie] appeared in the 1870s." This dish is called Shepherd's Pie when it's made with lamb, Cottage Pie when it's made with beef. But with ground lamb readily available in most major supermarkets and farmers markets these days, why wouldn't you use lamb? Besides, it's just so Eastery and Springy. A perfect dinner for those chilly April nights. To make the potatoes: Peel the potatoes and cut into 1/2-inch dice. Place in a medium saucepan and cover with cold water. Set over high heat, cover and bring to a boil. Once boiling, uncover, decrease the heat to maintain a simmer and cook until tender and easily crushed with tongs, approximately 10 to 15 minutes. Drain the potatoes in a colander and then return to the saucepan. Mash the potatoes and then add the stock, butter, salt and pepper and continue to mash until smooth. Stir in the egg until well combined. To make the filling: Place the oil into a 12-inch saute pan and set over medium high heat. Once the oil shimmers, add the onion & carrots and saute just until they begin to take on color, approximately 3 to 4 minutes. Add the garlic and stir to combine. Add the lamb, salt and pepper and cook until browned and cooked through, approximately 3 minutes. Sprinkle the meat with the flour and toss to coat, continuing to cook for another minute. Add the tomato paste, chicken broth, Worcestershire, rosemary, thyme, and stir to combine. Bring to a boil, reduce the heat to low, cover and simmer slowly 10 to 12 minutes or until the sauce is thickened slightly. Add the corn and peas. Stir until just thawed. Spread the mixture evenly into an 11 by 7-inch baking dish. Top with the mashed potatoes and smooth with a rubber spatula, creating a seal to prevent the mixture from bubbling up. Place the dish on a sheet pan on the middle rack of the oven and bake for 25 minutes or just until the potatoes begin to brown. Remove to a cooling rack for at least 15 minutes before serving.